The ‘Dimitria’ has its roots in 12th century Byzantine Thessaloniki. As a mark of devotion towards St Dimitrios, the city’s Protector and Patron, the people of Thessaloniki established a celebration in his name. In its earliest form, the celebration had a principally religious and commercial character. From the 10th century onwards, the city was after Constantinople the most important commercial and small crafts centre in the Eastern Roman Empire, with groups of merchants arriving with cargoes of goods and small crafts. In the harbour and the marketplace foodstuffs, textiles, oil and wine flowed in from Italy and Spain, there were soaps from Venice, leather and caviar from Russia, while precious stones, gold and silver were too in abundance. Thessaloniki was in the throes of change: together with the commercial celebration, performances of various types began to appear with tight-rope walkers, comics, mime shows and other thespians who populated the squares and the marketplaces, entertaining the crowds. According to reliable accounts, this celebration was not without its theatre based on ancient drama or its lectures by philosophers and scholars. During its zenith in the 13th and 14th centuries, Thessaloniki was awash with art workshops, art schools and educational centres, acquiring fame as a megalopolis in every sense of the word across the Balkan Peninsula. This acme was interrupted by the seven-year siege of the city by the Ottomans between 1422 and 1430, which culminated in the occupation of the city that year. The Dimitria however made its ‘comeback’ in 1966 and has since become one of the most important cultural institutions in the country. In the first year of its revival, the ‘New Festival’, as it was then called, had just 11 events, while later on it was to host up to 80 cultural events sometimes lasting up to four months. 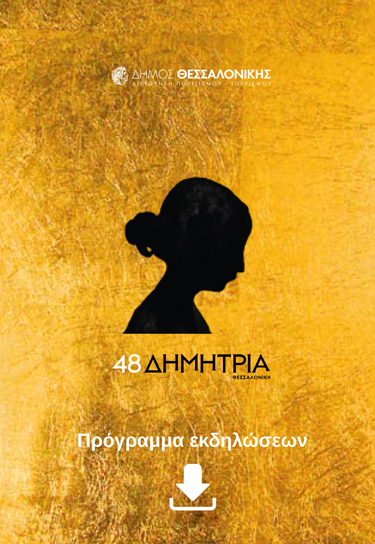 This year, 48 years after its revival, the Dimitria is hosting more than 50 events over a period of one month. From 26 September until 26 October 2013, music, dance, theatre and the visual arts will transform Thessaloniki into a multi-coloured cultural workshop.